While reminiscing over lunch in Mallorca, two semi-retired South African yacht-captains were reflecting upon what a wonderful and exciting life they had led. Old sea-stories were shared at the table and it became apparent that the career paths of these two mariners had been remarkably similar, and much adventure and good fortune had come their way on the high seas and in faraway harbours. It turned out that both had attended the same Maritime institution in Gordon’s Bay as sea-cadets, albeit under different circumstances and times. 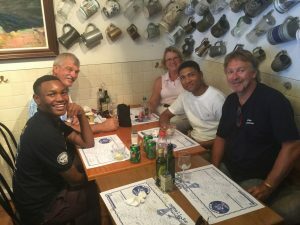 As the lunch wore on these two ‘Skippers’ decided that their good fortune should be shared and made available to less fortunate and aspiring young sailors in South Africa. With an existing relationship already in place between Phil Wade’s General Botha Old Boys Bursary Fund and the Lawhill Maritime Centre in Simons Town, South Africa, what better place to start than offering some of the students at Lawhill the opportunity to travel overseas and experience first-hand the life of the sailor aboard cruising and racing pleasure yachts. Through such international exposure to this exciting nautical world, these sea-cadets would be able to return home and share their experiences with other cadets in South Africa, and thus potentially inspire other future careers at sea. ‘Marine Inspirations’ was thus born with the idea of sponsoring young, underprivileged South African students to fly overseas and to introduce them to the world of international sailing. The idea is to show them the many varied aspects of the industry and the potential available to them. The Marine Inspirations steering team are currently working closely with Lawhill Maritime Centre (http://lawhillmaritimecentre.co.za/) and the S.A.T.S. General Botha Old Boys Association Bursary Fund (http://www.gbbursaryfund.co.za/) Both of these organisations are dedicated to promoting a rich and diverse grounding for young cadets during their advancement into the Maritime Industry – while at the same time completing their last three years of standard high-school education in South Africa. Students are typically aged between 15 and 17 years old. At Lawhill they engage the standard secondary-school curriculum subjects at Simon’s Town High School, as well as studying Marine Economics and Nautical Science at the Lawhill Maritime Centre, which is situated on an adjacent campus in Simon’s Town. These additional specific maritime subjects count towards their school-leaving Matriculation Certificate and equip them for advanced education possibilities in Maritime studies. General Botha Old Boys Association started a very successful Bursary Fund in 2011 and currently sponsor seven students from underprivileged backgrounds who are boarding and studying at the Lawhill Maritime Centre. The ‘Marine Inspirations’ mentoring project is now working closely with General Botha Old Boys Association and Brian Ingpen, the Head of Lawhill Maritime Centre, to show these students other inspiring opportunities that could await them on their career-paths. The intent of ‘Marine Inspirations’ is to use opportunities available aboard sea-going vessels and private yachts to develop a youth mentoring programme. These opportunities are made available by donors who help finance basic expenses and travel for the students to the vessels and events on the international maritime calendar. It is all co-ordinated and organised by volunteers and is totally not for profit. Marine Inspirations, in close collaboration with Lawhill Maritime Centre, and the General Botha Bursary Fund, will co-ordinate this unique international empowerment programme for selected students and provide them with unique and exciting opportunities to broaden their horizons and prepare them better for a dynamic career at sea. 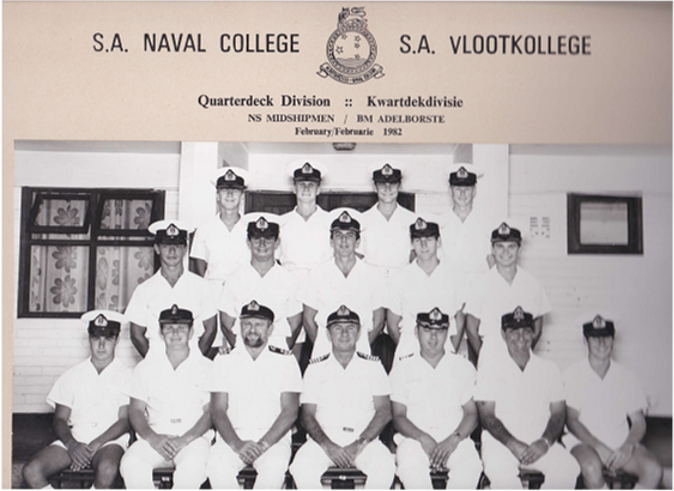 Most of the “Bothie Boys” (Members of the General Botha Old Boys Association, alumni of the Merchant Marine Training College of that name) clearly recognise the unique and diverse opportunities that their careers at sea and ashore have provided for them. This was mostly as a result of their “Bothie” education when at similar ages. Sharing the vast experience and fulfilment that these two yacht-captains, as well as ex-“Bothie Boys” and many other South African mariners have had, will certainly inspire ambitious youngsters of today – those who would not normally get this opportunity. We consider this initiative to be of huge importance and we are dedicated to increasing the number of young students and aspiring cadets that we can help on their way to a rewarding maritime career. Anthony Just (That’s him in the top left hand corner!) 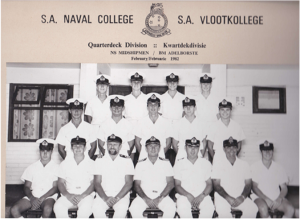 graduated from Gordon’s Bay Naval Officers’ Training College in 1981 during his national service commitment as an 18 year old. This was the very same institution in Gordon’s Bay that had been transferred in the 70’s to S.A Naval Training Command after an initial period for many years as ‘General Botha Merchant Marine Nautical College’. 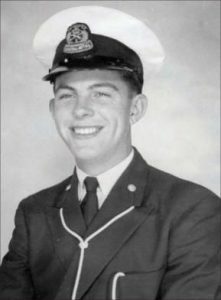 Phil Wade was a two year student at the General Botha Merchant Marine College in 1960/61 and completed his last two years of schooling at the college to obtain his school-leaving matriculation certificate. Same College, albeit under different control and 20 years apart. With a solid grounding from these strict military-style maritime academies, both of these youngsters found their journey to sea in different ways, and both ultimately received unique opportunities to embark upon exciting and adventurous voyages and accomplishments over the decades. After completing naval service in South Africa, Anthony Just went as a tourist in Newport, Rhode Island in 1983 to visit family, His brother announced that his timing was perfect….the America’s Cup final races were underway. Anthony had never heard of the America’s Cup…! One week later he was signed-on aboard a beautiful wooden yawl and bound for Bermuda and the Caribbean. His days at the Academy had provided a solid and valuable grounding for an unexpected future career at sea. This good fortune continued during the meteoric rise of the Super-yacht industry and the international charter market during the following decades. After 8 years in the Merchant Navy Phil Wade began his sailing career in 1970 following an invitation to join a yacht sailing from Cape Town to Rio de Janeiro, and after a fairly short time he was offered a paid sailing job to take a 123 foot Schooner built in 1906 from the Caribbean to the Seychelles Islands in the Indian Ocean. Phil’s new career was launched, and he has since sailed as ‘Skipper’ for many interesting yacht owners on a wide variety of yachts and to many challenging and exotic locations in the world. He is a well-respected Superyacht captain and has crewed aboard many racing yachts. Both Anthony and Phil agree unequivocally that their good fortune, experiences, and accumulated knowledge was in large part due to their disciplined education as teenagers at that very same Academy, and they therefore want to give other less-fortunate youngsters the opportunity to see and embrace career-corridors that they would perhaps never normally witness.